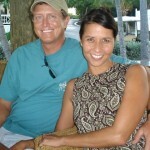 Steve Dovel, originally from Texas, and his wife Angela, from Nassau, have the enviable job of managing the private island of Bonefish Cay and its exclusive luxury resort. In an interview with Steve, writer Antoinette Price discovers what sets this magnificent island apart from all the others in the region, and what it takes to manage a private island and luxury resort. ‘Paradise’, ‘serene’, ‘beautiful’, ‘tranquil’ and ‘natural’ are the first five words that spring to mind when Steve thinks about Bonefish Cay. This is not hard to imagine of the perfectly positioned island that is both remote and easily accessed from anywhere in the world. Bonefish Cay, which takes its name thanks to its interesting shape and the amount of bonefish in the region, is considered to be part of the Northwestern Bahamas, whose entire archipelago covers 650 miles (1046 km) from the northernmost island of Bimini to the southernmost of Inagua. 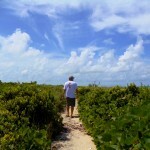 Located just four miles east of the Great Abaco islands, from where there is an easy drive to two international airports and approximately 150 miles (241 km) from the mainland of Florida, Steve says that when he is on the cay, he feels as if he is on a deserted isle miles from civilization. Can you see the neighbours? So what does a normal day look like for the lucky manager of this paradise island? Like many full-time employees, Steve gets up at six each day, but instead of getting ready for a grueling commute and a hard day at the office, he does a walkabout island check, before looking at his weather forecast sites. Then he gets in his boat and goes to pick up the crew on the mainland – there are three permanent staff. Steve and Angela live on the island when there are guests, along with the chef and one staff member. Then Steve runs through the project task list with the crew and they set off to accomplish them. “My daily tasks could be anything from generator, water maker, boat engine or battery bank maintenance to landscaping projects. There is always something to keep me occupied, which is why I love working here. I am a tinkerer at heart!”. It’s a hard life but someone’s got to do it! Of course some days may prove challenging and the work may be hard, but Steve says about such days, “all we have to do is look up, and we are encircled by the beauty of Bonefish Cay; the blue ocean around us, the bright white beaches, the lush green of our landscape, the array of birds that call the cay home. Every day we are reminded of how lucky we are to be here”. What does it take to manage a private island? After hearing about an average day in paradise, you may now be considering a career change. However, it is not as simple as it sounds. Steve comes to the table with an impressive CV of varied skills, gleaned from previous jobs that now make him the perfect private island manager. For the nine years prior to taking up the post on Bonefish Cay, he captained a private yacht, traveling between Florida and the Bahamas. He also did excursions up the east coast of the United States to Nova Scotia and down through the Virgin Islands to St. Martin. In addition, he worked as a scuba instructor for years in St. Thomas and also has a pilot’s license…not only does he have the air, sea and ground covered, he also has an in-depth knowledge and appreciation of Bonefish Cay and the whole region. 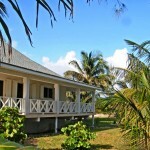 With such a choice of island resorts in the Bahamas, why do visitors choose Bonefish Cay? There are several very good reasons and Steve is well qualified to give them. Having already mentioned the excellent location and transport infrastructure, Steve believes the next most key point is the island’s natural setting. Being just yards away from a fabulous barrier reef, it is perfect for spectacular diving. 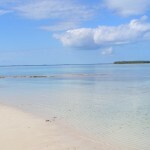 The Sea of Abaco on the south shore is a beautiful piece of water and a known playground for bottlenose dolphins, which can often be seen, when making the crossing to the mainland. There are plenty of mature trees, which are home to a variety of birdlife from humming birds to kestrels or even the odd pelican. Watching the almost tame night herons pounce on the fiddler crabs on the grounds is another of the favourite views. An essential component within this unique setting was the mindset of the island’s owners when they purchased it. “They understood that if you preserve nature, it tends to preserve you, and the owners made extraordinary efforts not destroy the islands’ natural resources when they built”, Steve explains. This was achieved by ensuring that the larger sections of the buildings were engineered to be moved by hand, thereby avoiding heavy machinery and destroying flora and fauna in the process. The result – the magnificent buildings blend with their surroundings instead of consuming them. “This combination of beauty, location and forethought is what makes Bonefish Cay very special, and the reason we believe you should see it yourself”. And what of the accommodation itself? Each room has a bedroom, sitting area, bath and deluxe furnishings, with its own unique design theme. Whilst all the rooms offer a luxurious experience, the master suite with its glass surround shower and spa tub of Brazilian granite, does have its unique attributes. Though the guests’ preferences always take precedence, Steve and Angela strongly recommend the mouthwatering fresh conch salad, made with conch, bird pepper, onion, tomato and green pepper all marinated in freshly squeezed lime and sweet orange. They help the chef by picking up the conch themselves off the shore in front of their cottage! They also encourage visitors to try the local fruit in season, like mango, tamarind or even the delicious sea grape that can be picked from the trees on the cay. Seafood lovers can indulge in dishes made with the local catch, such as snapper, grouper, conch, lobster and hogfish. Needless to say, the chef is very talented, preparing local and international cuisine, using all the local produce. When it comes to drinks, there is an abundance of delicious tropical fruit options. Steve describes his wife’s favourite fruit punch concoction from childhood days in the islands, of orange and pineapple juice, a dash of grenadine and bitters, shaken to frothy and poured over ice. For those who like a little dash of rum, coconut rum can be added to make it ‘leaded’ as the locals like to say. Bahama Mamas and Goombay Smashes are also favourite tropical drinks. 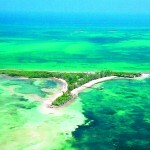 What activities are offered on Bonefish Cay and in the region? With 13 acres of land, Bonefish Cay is known for its tall trees and lush vegetation, such as buttonwood, sea grapes, sea lettuce, torchwood, sea oats and red mangrove, and long strips of beach. There are plenty of places to swim and snorkel in the gorgeous waters or just laze in the sun, whilst enjoying total privacy. Guests may choose to drift off to the sounds of the sea lapping the shores, whilst being massaged on the beach, and tennis courts and golf courses are nearby. The region around the island boasts clear, stunning waters, charming neighbouring cays and the amenities provided by the mainland of Great Abaco, such as towns, airports and supermarkets. Steve continues his brilliant pitch of the island and surrounding area with a little anecdote, “I would say that the waters are our most valuable asset… as the story goes, the Bahamian waters are so amazing that the astronauts on one of the Apollo Nine’s missions were quoted as saying that the two landmarks which stood out most clearly from space were the Great Wall of China and the stunning colours of the water that surrounds our islands”. 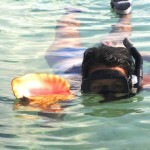 – Some of the other close-by cays, easily reached by boat include: Spanish, Pensacola and Green Turtle Cays. Great Guana and Elbow Cays can also be reached with a drive in the Bonefish Cay car to a local ferry boat on Great Abaco – a fun expedition in itself. It only takes 15 minutes to cross the four miles of sea. Steve adds that the people of the Abaco islands are very friendly and you can meet some true characters along the way! The magnetic beauty of this paradise operates as far as France :)! Congratulations!